For the 3rd time in the last 4 seasons, the Kentucky Wildcats will take home the prestigious NCAA Elite 90 Award at the NCAA women’s Division I Swimming & Diving Championships. This year, backstroker Asia Seidt won the award. The honor is given annually the highest GPA of all athletes who advanced to compete at the NCAA Championship’s final site, with 90 representing the 90 NCAA Championships, across all divisions, each season. Like her former teammate Danielle Galyer, who won the award back-to-back seasons in 2016 and 2017, Seidt has a perfect 4.0 GPA while majoring in kinesiology with a pre-physical therapy focus. The junior Seidt was given the award before the session began on Thursday evening in Austin, and proceeded to earn her 6th CSCAA First Team All-America honor by tying for 5th place in the women’s 200 IM with South Carolina’s Emma Barksdale (1:53.54). This is Seidt’s 3rd-straight NCAA Championship meet, and lasst year she was the NCAA runner-up in the 200 backstroke. 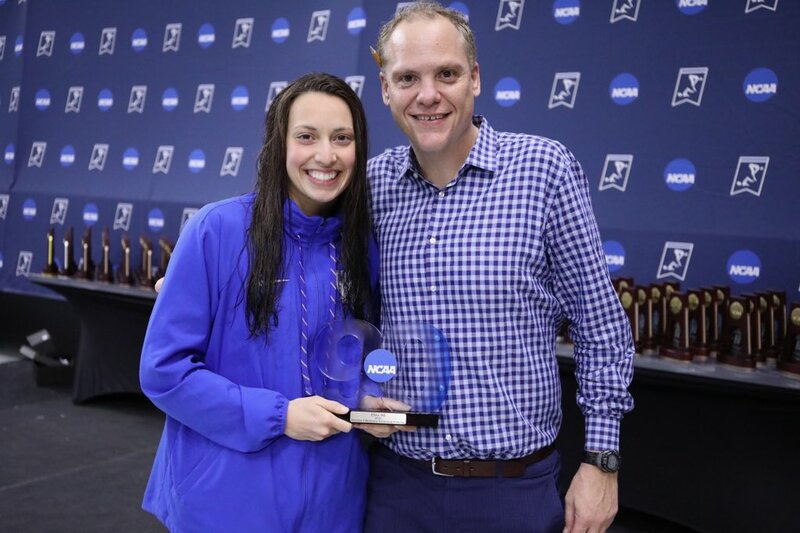 She was named the 2019 SEC Scholar-Athlete of t he Year in February (the 3rd time in 5 seasons that a Kentucky swimmer has won that award). She also won the 2018 Kentucky Female Athlete of the Year award, and the 2017 SEC Female Freshman of the Year honor. She holds 6 Kentucky school records individually and is a member of 4 record-setting relays, and this summer will swim at her 2nd World University Games. To be eligible for the award, an athlete must have participated in their sports for at least 2 years with their school, and must be an active member of the team and designated to participate at the championships. Ties are broken by the number of credits completed. Congrats for a terrific performance. She has been a great representative for Coach J and the team. Well done! Wow UK is coming on very strong. A well rounded young lady and great representative for all. Congratulations to her roommate, team, coaches and parents!